6201 Princess Elizabeth, along with other Princess Royal class members, has been modelled by some of the top manufacturers in the industry including Hornby, Triang, Bassett Lowke & Trix. 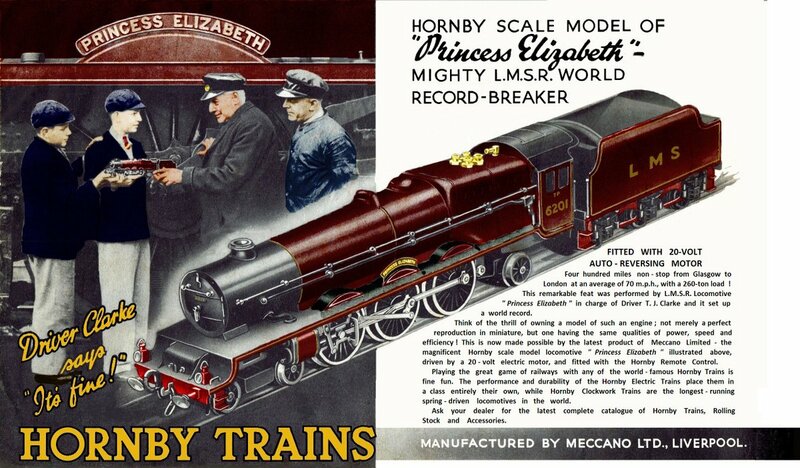 In 1937 Hornby released what is widely regarded as their finest pre-war O Gauge model – 6201 Princess Elizabeth. The model featured on the front of the “Hornby Book of Trains” (1937-8), and still features on current Hornby licensed merchandise today. Today, these early Hornby 20 volt models are collectors items and regularly change hands for 4 figure sums of money. Below is the accompanying advert for the famous O Gauge Hornby model, featuring two schoolboys from Liverpool (where Meccano / Hornby were based), with 1936 record run driver and fireman Tom Clark and Charles Fleet. The image at the top of the page depicts Bassett Lowke’s rival model of the famous LMS Stanier Pacific. Ref (BL99006). Just as 6201 Princess Elizabeth was one of the main rivals to the LNER A1s and A3s like 4472 Flying Scotsman. In the world of model railways Princess Elizabeth still competes with Flying Scotsman, Mallard, Evening Star and Britannia for the top spot by popularity on the ‘Hornby Guide’ website. Here follows a list of links to 6201 Models which feature on the Hornby Guide Website, though some models are yet to feature on the website such as Hornby R2215 Golden Jubilee Ltd Edition in LMS Crimson Lake with 18ct gold embellishments, and R2426 50th Anniversary Edition in BR Black. This is not an exhaustive list, but more models and details on models of 6201 to be added in due course. We often carry some pre-owned models of 6201 Princess Elizabeth and other LMS Princess Royal classmates in our shop, so please click here for more details.